Red-bellied Woodpecker on a suet feeder. Put out some of their favorite food and they will come. The rest is up to you. What is a suet feeder? The feeder that suet cakes fit in or something else? I do have a couple of woodpeckers- saw a Flickr this morning trying to get to the suet nuggets. And I have seen a Ladder Back but not lately. I only have a couple of small desert trees that don't seem to attract them. They hang out in the large cottonwoods down by the river. I make my own suet feeders by using short lengths (1'-2') of stout limbs roughly 3"-5" thick and drill 1/2"-3/4" diameter holes by 1-1/2" deep. Don't make the holes too shallow or large as the other birds with shorter beaks will hog all the suet. I pack the holes with non-greasy peanut suet, and hang the feeder from a Shepard's crook, sometimes several together. I attach sections of branches above the feeder for birds to perch. I'm shooting from a blind most of the time at a distance of 15'-25'. This distance is ideal for 300 to 400mm lenses. I prefer high pixel count cameras which allow for extra reach by cropping for smaller birds. Fast and accurate focus is almost essential, although most current cameras can handle this. I've been doing this for many years although this method is not original and don't remember where the idea came from. We've been getting Acorn WPs at our feeder. This beautiful shot has given me an idea for getting more natural shots. Thanks for sharing another excellent shot. Thanks for the information. Sounds easy enough. I am going out to the desert today to look for downed cactus limbs and misc branches to put together for casual perches. My feeders are hung from shepherds hooks in front of large bushes that the birds like to hide in. I can photograph from an open window in the kitchen (screen removed) or sit quietly in the yard. Excellent shot, Joe. Do you make your own suet? Peanut butter smeared on the bark of a tree will also work for a more natural setting. Also. 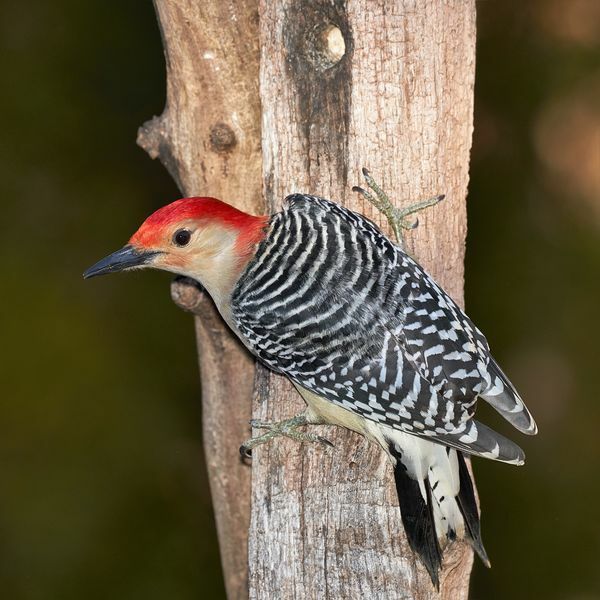 Wild Birds Unlimited has a product specifically designed for wild birds, called Butter Bark. It also comes in a paste form that can be spread directly on tree bark, or in other hanging feeders, that the birds love. I tried this several years ago and it was a disaster. The oil from the peanut butter absorbed in to bark. Squirrels quickly found the peanut butter and ate it including the bark. As far as I could tell not a single bird got any of it. It took several seasons for the trees to recover. Very bad advice in my opinion.